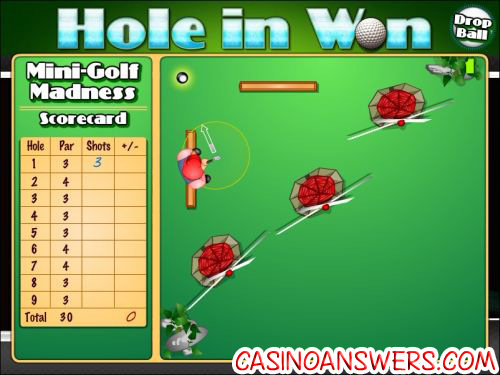 Hole In Won iSlot Guide & Review - Casino Answers! 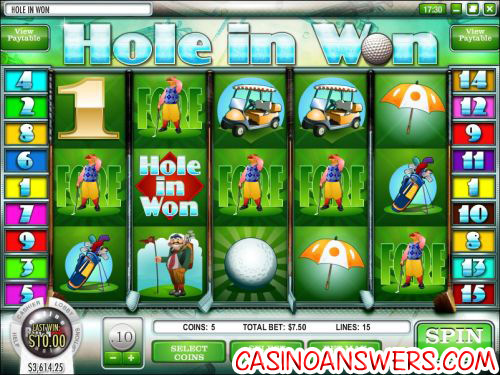 Hole in Won is a 5-reel, 15-line iSlot branded interactive video slot developed by Rival, featuring expanding wilds and a bonus game. You can play the Hole in Won iSlot at US-friendly online casinos Rockbet Casino and Cocoa Casino. Playing Hole in Won is very easy. All you have to do is select your coin value between $0.01, $0.05, $0.10, $0.25, $0.50 and $1. Next, you can select the number of coins you wish to bet per line (up to 5) and the number of paylines you wish to select (up to 15). You can make a bet as small as $0.01 per spin on Hole in Won and as large as $75 per spin. Use the “Spin” button to start playing. Alternatively, if you wish to play all 15 paylines at 5 coins per line, use the “Bet Max” button to spin the reels. For real money players who wish to play a lot of spins without having to click the “Spin” button each time, there is an autoplay mode available. The wild symbol in Hole in Won is the Eagle symbol. It only appears on reels 2, 3 and 4, but whenever it is triggered, it will expand to cover the entire reel. This is a great way to create new winning combinations. The expanding wild will substitute for all symbols on the Hole in Won video slot except for scatter symbols. The Hole in Won iSlot is built around the bonus game. There are no free spins, no scatter payouts and a low top jackpot. However, we feel the bonus game is able to make up for this. Keep in mind, if you are looking for an easy “choose three items” bonus game, Hole in Won may not be for you. Get a $2500 signup bonus to play Hole in Won and all of the rest of the iSlots at Rockbet Casino! Where can slots players from the USA play Hole in Won? Can I get a no deposit free cash bonus to try out the Hole in Won iSlot? Yes, Casino Answers offers an exclusive $100 no deposit bonus at Rockbet Casino playable on all slots. You can also get a $10 free cash bonus at Cocoa Casino. What special features are on the Hole in Won interactive slot machine? The Hole in Won iSlot features expanding wilds and a skill-based bonus game that is essentially a video game you can win money playing. Where can I find some more iSlots? You can find all of the iSlots at Rockbet Casino. If you want to read some more iSlot game reviews, you can read our As the Reels Turn 1 iSlot Review, Fixer Upper iSlot Review, Heavyweight Gold iSlot Review, Psychedelic Sixties iSlot Review, Rock On iSlot Review and Spy Game iSlot Review. If you’re a fan of these interactive video slots like ourselves, there will be more to come in the future so you might want to keep an eye out for more! Where can I read more about Rival online casinos? For more details on Rockbet Casino, you can read our Rockbet Review. Golf slot machine? What golf casino games are there?